Thoracolumbar spine injuries form a significant portion of any spine surgeon's practice. In an epidemiological study by Hu et al. in the Canadian population, the incidence of spinal injuries was 64/100,000 population/year. Injuries in this region can fall anywhere in the spectrum between stable transverse process fractures to highly unstable fracture–dislocations. It becomes imperative in the setting of evaluating and treating these injuries along with assessing outcomes that we as spine surgeons speak the same language. The need to classify, with a focus on communication, outcome, and prognosis, thus forms the baseline for all academic and clinical discussions. We thus need to examine why we need to classify, what is an ideal classification system, what is the validity of current classification systems, and which would be the best one to use in the current setting. We performed a search using PubMed, Google Scholar, and Ovid with classification, thoracolumbar fracture, and spine trauma as keywords to find relevant articles for this paper. Why Do We Need to Classify? A classification of injuries is necessary to develop a common language for treatment indication and outcomes. Spinal injury classification systems are used as a prognostic tool to determine the natural history and outcomes, guide treatment decision-making, and predict the possibility of complications. However, as stated by Mirza et al., classifications are generalizations which group objects with common attributes together, thus making them useful to predict behavior of the members. This generalization involves discarding a certain level of detail while still providing enough valuable information about the object, thus justifying the loss of detail. Our problem arises from the fact that we need to bring in an arbitrary demarcation into naturally occurring events (injuries) which are prone to variability. The injury per se is a continuous variable and can range from the innocuous to the severe. The classification forces us to set discrete end points for a set of nondiscrete variables. The paradoxical nature of classifications is to lose details to favor effective grouping and set discrete end points for continuous variables. Thus, our search for an ideal classification is unlikely to end. Ideal Classification – elusive and Paradoxical? The range of reported expectations for ideal spinal injury classifications has already been proposed by Mirza et al. They stated an exhaustive list of requirements which give each injury a unique identification and terminology along with information regarding the severity of injury, clinical and radiological characteristics and choice of treatment. The classification system should also be able to describe the pattern and severity of both anatomic and neurological injuries, thus providing prognostic factors for treatment and results, risk of deformity, natural history, and risk of additional neurological injury. As you can see from these expectations, every classification is walking a fine line trying to be succinct, clear, and crisp, while at the same time, not losing clarity to make it pointless. An ideal classification should be simple reliable, comprehensive, and reproducible. Once we arrive on this elusive and ideal classification, it needs to be validated by multiple observers in different settings. It must have construct validity in that the fracture categories are associated with equivalent patient outcomes for specific treatment plans. Van Middendorp et al. suggested that in the current scenario, creating an idea spinal injury classification remains an unachievable objective. They, however, suggested that a good spinal injury classification system need not be comprehensive and any thoracolumbar spine injury classification should only include the injury characteristics of the vertebral column. Neurological injury must be considered a clinical presentation of the vertebral column injury. They also suggested that computed tomography (CT) of the spine would probably be the best imaging to base the classification on and magnetic resonance imaging (MRI) is not routinely indicated in the absence of CT abnormalities and neurological deficits. They described integrating the presence of neurological injury into a spinal injury severity score along with evaluation of other variables such as preexisting comorbidities and concurrent non-spine injuries. Based on this, they suggested eight properties for an ideal spinal injury classification category. Injury characteristics easily discernible on diagnostic images. The other point of contention is classifying the injuries based on morphological characteristics as opposed to biomechanical injury mechanisms. This dilemma makes it difficult to convert the “observation process” (assessment of radiological injuries) into a conversion process (classification system). Simply put, it is possible to look at images of a spinal injury and predict the biomechanical forces that were in play to cause it, but it would not be ideal to use the biomechanical force per se as a classification category. The reason for this is that any biological tissue will fail differently even if the vector of forces acting on it at the initial moment of injury is the same. This is akin to saying that an egg dropped from the same height on the same floor will break in exactly the same way each time. Although we can surmise about the probable forces acting on the spinal column, the force itself cannot be used as a valid classification category. The first attempt at grouping thoracolumbar fractures into various types was by Sir Watson-Jones in 1938. The first classifications proposed after Watson-Jones were all based on X-ray until 1980 when CT scans became commonly available. The CT presented a more accurate display of the fracture configuration. There was, however, a clear understanding that certain fractures were deemed unstable and the concept of factors causing stability was introduced. The idea behind recognizing instability was that unstable fracture patterns required stabilization. This stabilization was earlier achieved by casting, but as spine surgery evolved, various modes of internal fixation were developed. The progress in operating theater evolution with decreased infection rates and better metallurgy was also reflected in the evolution of classification systems. Sir Watson-Jones reported his personal experience with 252 fractures. It was predominantly a fracture based on X-ray morphology dividing it into 7 types of fractures but only 3 principle categories: the simple wedge, comminuted fracture, and the fracture–dislocation. All fractures except, fracture–dislocations were treated by reduction in hyperextension and casting. Fracture–dislocations required open surgical reduction followed by extension casting. His treatment goal was healing with perfect radiographic alignment. Minimizing kyphosis was one of the key treatment objectives and he reported that all patients with severe wedging complained of persistent pain. Surprisingly, he noted that a third of these patients with good radiographic results continued to have pain at the end of 12 months. A small percentage of these (4%) also reported severe pain, suggesting that good radiological results do not always correspond to good patient outcomes. Nicoll, proposed his classification based on his work with coal miners sustaining spinal injuries. He included the three major categories as defined by Watson-Jones and added a flexion rotation injury pattern as described by Chance. He was more interested in patient outcomes in this community and considered a perfect functional result as returning to full mining work. He achieved this result in 30% of his patients (50/152). Interestingly 24 (nearly 50%) of these patients who returned to high demand work had residual deformity. Nicoll was the first to suggest a separation between “stable” and “unstable” fractures. Unstable fractures had a risk of increased deformity and possible cord injury with functional activity. Stable fractures required only bed rest for 3 to 4 weeks followed by progressive return to activity. Unstable fractures, however, required immobilization in a plaster bed for 4 months or longer. He believed that stability of the injured segment was obtained through spontaneous fusion. Sir Holdsworth first outlined his classification in a lecture at the Royal College of Surgeons in 1962. His observations were subsequently published twice. His classification was applicable to the entire spine (cervical and thoracolumbar). He also clarified the difference between a simple wedge which he called a wedge compression fracture and comminuted wedge fracture which he called a burst fracture. This too, was an X-ray-based classification where he reinforced the importance of looking at the posterior elements, especially separation of the spinous process as well as the dislocation or fracture of the articular processes. He separated the category of fracture–dislocations into four – extension injuries which had the posterior ligament intact and had a disruption of the anterior ligament, pure dislocations where there was displacement and locking of the articular processes, rotational fracture–dislocations where there was a lateral shift of the spine along with a slice fracture of the upper end plate, and shear fracture where there was a forward displacement of the entire vertebra. Holdsworth also gave very clear guidelines on the pattern of neurological deficit and prognosis for recovery. He too, was of the same opinion as Nicoll that a good functional result did not necessarily need a good radiological alignment. Kelly and Whitesides restricted their classification to lumbodorsal junction basing on the fact that this was the most common segment sustaining injury and paraplegia. They were firm in the belief that neurological damage does not occur unless there is dislocation of the posterior elements. Basing on this, they divided the spine into two columns, the solid of vertebral bodies and hollow column of the neural canal. They went on to give a clear explanation on why laminectomy should be condemned for the following two reasons: it would further destabilize the second column and local impingement of the spinal cord or nerve roots by hematoma or small fragment is relatively minor consideration. They proposed a working classification dividing lumbodorsal injuries into stable fracture (wedge and stable burst) and unstable fractures where there has been a posterior element dislocation. They further classified unstable injuries into recent and old. Clearly, treatment was operative in unstable injuries. Posterior column stabilization in fresh injuries would lead to sufficient stability to allow the anterior column to heal. If, however, the anterior column was also grossly unstable, then it would require reconstruction. The Kelly and Whitesides classification was interesting in their two-column model of stability, but this was more a descriptive report with only 11 cases. Denis while acknowledging the Holdsworth classification as a major landmark disagreed with the idea that pure posterior element disruption could cause instability without further disruption of the posterior longitudinal ligament and annulus fibrosis. He proposed the concept of the middle column and stated that only when posterior and middle columns were disrupted, there could be acute instability. He classified major injuries into four categories based in the mechanism of failure – compression, burst, seatbelt type, and fracture–dislocation. Most papers quoting Denis fail to note that he did attempt to define instability. He divided instability into three degrees. Instability of the first degree was only mechanical instability, second degree was neurological instability, and third degree was both. This classification was the first to use CT scan to classify injuries and also suggest surgery as the treatment of choice for burst fractures. McAfee was the first to publish a series of cases who underwent CT scans for thoracolumbar fractures. He put together previously existing concepts of Denis and Kelly and Whitesides clearly stating that there were only three main forces to act on the middle column, i.e., axial compression, axial distraction, and translation in the transverse plane. Using this, he classified injuries into six types. Translational – All three columns fail in shear. Interestingly, this was the first study to suggest that neurological deficit did not correlate with amount of canal occlusion. He was clear that if the middle column failed, then the injury required fixation. The entire management was based on the available instrumentation system of that era which included Harrington compression and distraction systems and Luque's segmental wiring systems. The mechanistic classification of Ferguson and Allen based on a study of 54 patients tried to classify fractures based on their presumed mechanism of injury. This classification was never widely used. Part of the reason why this classification was not successful was because none of the injury categories could provide sufficient responses to treatment algorithms. The major drawback of this classification was as we discussed earlier. A deforming force can cause a different set of injuries based on how the spine fails, and the same deforming force if aborted early would lead to a stable injury whereas further progression would lead to an unstable spine. McCormack classification was proposed to integrate the newer implant systems of the time into treatment protocols so as to be able to predict failure rates. This was the first study to assess results of fractures using pedicle screw systems (variable screw placement plates and screws). This was a massive departure from the previous studies which used distraction, compression or segmental wiring systems. They based the classification on the degree of comminution, apposition and kyphosis and suggested that a score ≥7 tended to fail. They suggested that these fractures should undergo a follow-up anterior short-segment vertebrectomy and strut fusion. They reserved the long-segment instrumentation for the patients with poor bone stock or who would not tolerate two-staged reconstruction. The major issue with this classification was it refused to take into account ligamentous and neurological injuries. Currently, the classification is used to predict failure of short-segment instrumentation in burst fractures. Magerl et al. proposed the comprehensive classification of thoracolumbar fractures based on the AO long-bone fracture classification using 3 × 3 × 3 grid. It was a pathomorphological classification dividing fractures into major categories: A, B, and C, where A was a compression injury, B was a distraction injury, and C was a rotational injury. They analyzed 1445 cases at 5 different institutions to arrive at the classification which was the first collaborative classification published. It was distinct in that it had clearly recognizable primary groups based on morphological patterns, thus satisfying many of the desirable criteria for spinal injury classification systems. However, the subtypes and subdivisions listed 53 different injury patterns, and the reliability of this classification was poor when injury categories included groups and subgroups below the primary three types. Moving across the grid either from left to right or top to down meant increasing severity of injury and chance of neurological deficit which could then predict worsening outcomes and morbidity for the patient. They, however, could not clearly demarcate stable from unstable. The thoracolumbar injury classification system (TLICS) was conceptualized by the Spine Trauma Study Group (STSG) following a survey given to the experts in the field of spine trauma. The idea was to score fractures based on morphology of the injury, integrity of the posterior ligamentous complex, and neurological status. If the patient scored anything <4, treatment was nonoperative. If the patient scored >5, the treatment was operative. A score of 4 could be treated either way based on the surgeon's choice after including other considerations such as polytrauma, comorbidities, previous scars, and preexisting spinal disorders. As a classification system, it lacked definite categories though it provided an ideal easy-to-use scale to determine stability and treatment protocols. It did not contain the necessary information for the surgeon to accurately communicate the “fracture personality.” It also was unable to provide guidelines on what the requisite surgery would be. An MRI was required in all patients to score PLC (Posterior ligamentous complex) injury. The major drawback to this was MRI availability in trauma centers and the logistical feasibility of shifting the polytrauma patient for an MRI. Although Lee et al. showed a high sensitivity, specificity, and accuracy for PLC injuries on fat-suppressed T2-weighted sagittal images, the study showed that 21 out of 34 patients had radiographic and clinical evidence of PLC injury and only 6 patients who had a clinically and radiographically undetectable PLC injury which was detected on an MRI. Based on MRI findings, these 6 patients underwent operative treatment. They, however, had no follow-up of a comparative group of patients treated conservatively. Hence, the natural history of occult PLC injuries detected on MRI in thoracolumbar injuries remains unknown. Interestingly, a comminuted fracture with a load sharing score of >7 without a PLC injury on an MRI is scored 2 points and treated nonoperatively. The fallacy of doing so was brought to light by Mattei et al. The thoracolumbar injury classification and severity score was the modification of the thoracolumbar injury severity scale and score (TLISS) by STSG in 2005 changing the category of mechanism of injury into morphological characteristics. The idea behind this change was as suggested earlier that morphological assessment of the injury is probably better than a classification using mechanism of injury. Following a study done in 2007, TLISS was found to be more reliable. However, we tend to agree with Van Middendorp when he says that the difference between the TLISS and TLICS is slight and semantic. The TLICS provided important contributions toward creating a score-based system for classification of spinal injuries, but eventually, it also fell well short of an ideal classification. The Magerl classification was adopted and widely used by the AOSpine community, but there was significant evidence to suggest that it was not uniformly followed across the entire spine community. In fact, in an online survey conducted in 2013, 42 spine experts responded to a questionnaire on day-to-day usage of three different classification systems (AO, TLICS, and Denis). Nearly 47.5% of the respondents said that they would use the TLICS, but when asked about the practical implementability, the distribution was more even across the TLICS (30%), AO (23%), and Denis (25%) classification. This study reinforced the fact that we still do not have an ideal classification system and there is a trend toward moving to older more descriptive classification systems to facilitate easy practical implementability [Table 1]. Another controversy that was introduced was the necessity of MRI scans to classify injuries. Two major issues with this was the availability of MRI in a trauma setup and also the accuracy of an MRI in comparison to a CT for majority of the spine injuries. Multiple studies have been published to assess reliability of fracture classification systems,,, and no one classification system satisfies all the criteria [Figure 1]. 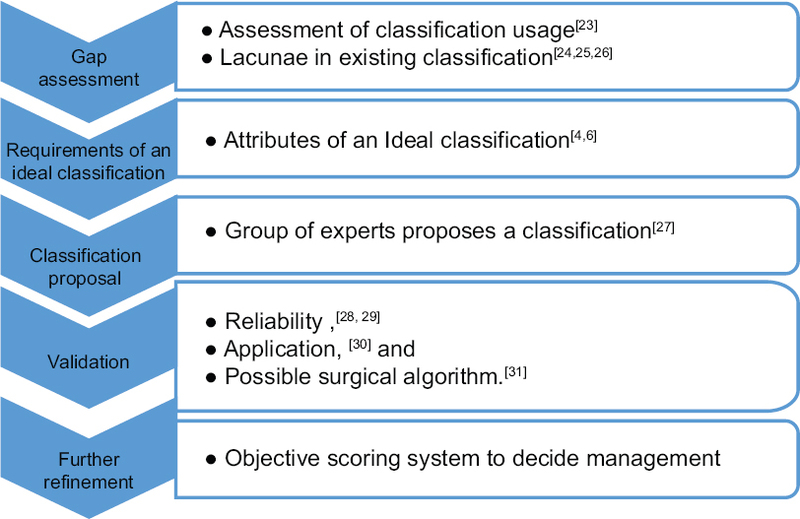 In 2009, AOSpine recognized the lacunae in existing spinal injury classification systems and reviewed what an idea spinal injury classification system should consist of. The AOSpine and STSG published in 2013 their AOSpine thoracolumbar spine injury classification system which integrated elements of Magerl and TLICS into a single classification system. The key merits included a grading of neurological deficits and addition of case-specific modifiers (occult PLC injuries and patient-specific comorbidities). This classification sought to present a morphological grouping along with an injury severity score that could guide treatment. They proposed that MRI only be used when there was suspicion of an occult PLC injury. They proceeded to validate this classification by doing a series of studies on reliability,, application, and possible surgical algorithm [Table 2]. The first in the series looked at the importance of PLC injuries in AO Type A fractures and came to conclusion that the M1 modifier (occult PLC injuries) should not affect the choice of treatment. A review article in the global spine journal looked at whether the AOSpine thoracolumbar spine injury classification system could reliably be applied to all the thoracic and lumbar vertebra including those at the cervicothoracic junction and lumbosacral junction. They came to the conclusion that the surgeon must use his clinical judgment for the optimal treatment of such fractures. Further work was done to develop an injury score based on survey on 100 worldwide spine surgeons. The three subgroups were allotted points based on this survey clearly showing worsening severity associated with higher score. This was called the TL AOSpine injury severity score. Another survey was conducted to decide how the scoring system could guide surgical intervention. Clearly, a majority of surgeons agreed that Types B and C fractures required surgical interventions. A4 type fractures were also strongly recommended for surgical management. The controversy, however, continued regarding A3 (incomplete burst) where there were strong proponents for nonoperative management. An ongoing study has been initiated to look at the A3 and A4 fractures toward coming to a clearer decision on management of these two subtypes. Rajasekaran et al. conducted another survey among two group of surgeons, one with <10 years of experience and another group of surgeons with >10 years of experience. They came to the conclusion that the younger surgeon was more adept at using the newer classification system; however, they found wide variation in choice of management for Types A3, A4, and B1 fractures. The AOSpine is a classification system in evolution trying to pick the best attributed of previous classification systems and create subgroups and treatment guidelines based on consensus decision by large groups of surgeons. It is, however, not without its drawbacks including trying to understand the role of modifiers (M1 and M2), the plan for surgical management, and also the adoption of this classification system across the entire spine community. The ideal spinal classification system still remains elusive. The Denis and AO-Magerl classification is shown preference by surgeons because of the pathomorphological subsets but had a serious drawback in not including the neurological status which is a massive indicator of quality of life. TLICS attempted to rectify this by providing more objective scoring system which, however, could not be validated in all settings. The AOSpine thoracolumbar spine injury severity system combines the best of the Magerl and TLICS systems, thus creating what would probably be the most comprehensive and management-oriented classification system to date. This, however, does not mean that we have reached the end of the road. There are still many gray areas that require further clarification. The systematic approach of the AOSpine trauma knowledge forum to these dilemmas with consensus opinion will hopefully give the spine surgeon community a strong and reliable classification system. Garbuz DS, Masri BA, Esdaile J, Duncan CP. 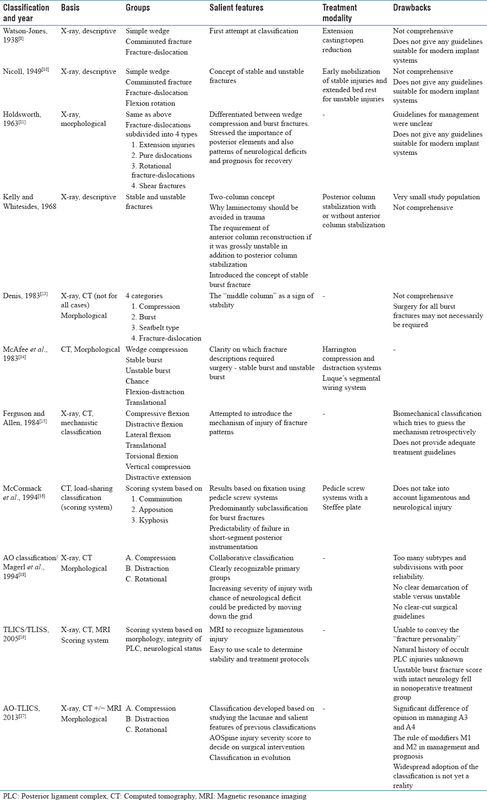 Classification systems in orthopaedics. J Am Acad Orthop Surg 2002;10:290-7. Mirza SK, Mirza AJ, Chapman JR, Anderson PA. Classifications of thoracic and lumbar fractures: Rationale and supporting data. J Am Acad Orthop Surg 2002;10:364-77. Bland JM, Altman DG. Statistics notes: Validating scales and indexes. BMJ 2002;324:606-7.
van Middendorp JJ, Audigé L, Hanson B, Chapman JR, Hosman AJ. What should an ideal spinal injury classification system consist of? A methodological review and conceptual proposal for future classifications. Eur Spine J 2010;19:1238-49. Watson-Jones R. The results of postural reduction of fractures of the spine. J Bone Joint Surg Am 1938;20:567-58. Chance GQ. Note on a type of flexion fracture of the spine. Br J Radiol 1948;21:452. Nicoll EA. Fractures of the dorso-lumbar spine. J Bone Joint Surg Br 1949;31B:376-94. Holdsworth FW. Fractures, dislocations, and fracture-dislocations of the spine. J Bone Joint Surg Br 1963;45:6-20. Kelly RP, Whitesides TE Jr. Treatment of lumbodorsal fracture-dislocations. Ann Surg 1968;167:705-17. Ferguson RL, Allen BL Jr. A mechanistic classification of thoracolumbar spine fractures. Clin Orthop Relat Res 1984;(189):77-88. Magerl F, Aebi M, Gertzbein SD, Harms J, Nazarian S. A comprehensive classification of thoracic and lumbar injuries. Eur Spine J 1994;3:184-201. Vaccaro AR, Lehman RA, Hurlbert RJ, et al. A new classification of thoracolumbar injuries: The importance of injury morphology, the integrity of the posterior ligamentous complex, and neurologic status. Spine (Phila Pa 1976) 2005;30:2325-33. Mattei TA, Hanovnikian J, H Dinh D. Progressive kyphotic deformity in comminuted burst fractures treated non-operatively: The Achilles tendon of the thoracolumbar injury classification and severity score (TLICS). Eur Spine J 2014;23:2255-62. Whang PG, Vaccaro AR, Poelstra KA, Patel AA, Anderson DG, Albert TJ, et al. The influence of fracture mechanism and morphology on the reliability and validity of two novel thoracolumbar injury classification systems. Spine (Phila Pa 1976) 2007;32:791-5. Chhabra HS, Kaul R, Kanagaraju V. Do we have an ideal classification system for thoracolumbar and subaxial cervical spine injuries: What is the expert's perspective? Spinal Cord 2015;53:42-8. Lenarz CJ, Place HM, Lenke LG, Alander DH, Oliver D. Comparative reliability of 3 thoracolumbar fracture classification systems. J Spinal Disord Tech 2009;22:422-7. Wood KB, Khanna G, Vaccaro AR, Arnold PM, Harris MB, Mehbod AA, et al. Assessment of two thoracolumbar fracture classification systems as used by multiple surgeons. J Bone Joint Surg Am 2005;87:1423-9. Vaccaro AR, Baron EM, Sanfilippo J, Jacoby S, Steuve J, Grossman E, et al. Reliability of a novel classification system for thoracolumbar injuries: The thoracolumbar injury severity score. Spine (Phila Pa 1976) 2006;31:S62-9. Kepler CK, Vaccaro AR, Koerner JD, Dvorak MF, Kandziora F, Rajasekaran S, et al. Reliability analysis of the AOSpine thoracolumbar spine injury classification system by a worldwide group of naïve spinal surgeons. Eur Spine J 2016;25:1082-6. Schroeder GD, Kepler CK, Koerner JD, Oner FC, Fehlings MG, Aarabi B, et al. Can a thoracolumbar injury severity score be uniformly applied from T1 to L5 or are modifications necessary? Global Spine J 2015;5:339-45. Vaccaro AR, Schroeder GD, Kepler CK, Cumhur Oner F, Vialle LR, Kandziora F, et al. The surgical algorithm for the AOSpine thoracolumbar spine injury classification system. Eur Spine J 2016;25:1087-94. Kepler CK, Vaccaro AR, Schroeder GD, Koerner JD, Vialle LR, Aarabi B, et al. The thoracolumbar AOSpine injury score. Global Spine J 2016;6:329-34. Rajasekaran S, Kanna RM, Schroeder GD, Oner FC, Vialle L, Chapman J, et al. Does the spine surgeon's experience affect fracture classification, assessment of stability, and treatment plan in thoracolumbar injuries? Global Spine J 2017;7:309-16.